A mouse wheel or a scroll wheel is created for easy scrolling and better navigation. It is very handy and helpful especially when you scroll up and down long pages. By default, the mouse wheel move up and down three to four lines each time you roll it through a webpage. You might get frustrated due to the slow scrolling speed and perhaps a faster pace will be ideal. If you are using the Firefox browser, Mozilla offers users a simpler way to adjust and modify the browser’s default scrolling speed. To change the default mouse wheel’s scrolling speed, users need to edit the browser’s configuration setting in the about:config entries. To edit it, users just need to access the Firefox browser, then type about:config in the address bar and press enter to continue. Users will be prompted a message to warn users that the changes to the default setting can be harmful. Click “I’ll be careful, I promise!” to proceed. 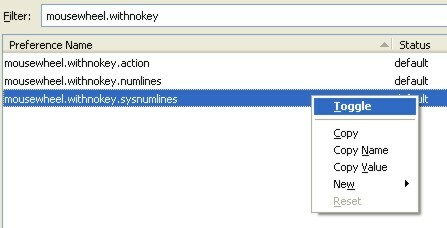 Right click mousewheel.withnokey.sysnumlines and select Toggle. Once users click to Toggle, the default value will change from True to False. Right click mousewheel.withnokey.numlines and select Modify. Users can enter the value from 1 to any other number. The higher number, the faster the scrolling speed. Users can check the speed by opening a new tab or new Window to see whether the speed is satisfactory.